Hotel Phuntsho Pelri or "The Palace of Great Contentment" is a blend of traditional Bhutanese architecture with modern and comfortable facilities. Located in the heart of Bhutan's capital city, Thimphu, this 3-star property aims at creating the most enjoyable and quality stay for guests while remaining affordable. 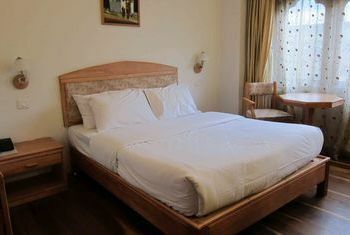 Phuntsho Pelri features 49 rooms with 2 studio apartments, 2 suites, and 43 Standard/Dexlure rooms. The room is simple but bright and fresh. There's a nice lounge cafe bar, and a lovely Thai restaurant and a Turkish-style spa.